Many cruise lines advertise "cruises to nowhere," which might sound intriguing but leave you asking "just where exactly is nowhere?" Rest assured that nowhere is somewhere, indeed: These cruises simply go out to sea for a short sailing that's devoid of ports, where the main destination is the ship. On these brief getaways, usually lasting just one or two nights (but sometimes three), ships sail out to international waters -- usually just far enough so that they can open the casino and duty-free shopping -- and then turn around and come back to the same port a day or two later. Passengers don't have the opportunity to set foot on land. 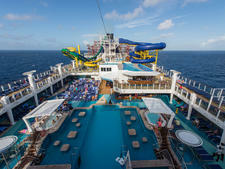 These quickie cruises are designed to immerse passengers into the ship's offerings, and they're almost always run on larger ships that tout plenty of onboard diversions. 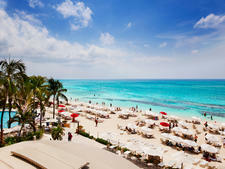 Cruise lines offer them for several reasons. The first is to lure new cruisers, knowing full well that if clients enjoy their little test run, they're likely to return for longer sailings down the road. The companies sometimes schedule cruises to nowhere (or CTNs, as Cruise Critic members call them) to fill gaps. It's a perfect way for the line to make a few dollars while a cruise ship is lingering between shifts of its regular itineraries or preparing to reposition for the season. They're also offered on occasion to introduce a cruise ship as it arrives in its new homeport and, more commonly, as way to debut a brand-new vessel to the public and/or industry types (travel agents, journalists, etc.) ahead of its normally scheduled itineraries. Who books a cruise to nowhere? New Cruisers: If you're a first-time cruiser who's hesitant to commit the time and money required for a longer sailing, a cruise to nowhere proposes the perfect way to test the waters. You'll have a short spell to try out your sea legs and sample what onboard life is like. By the time you return to land, you should know full well if cruising is right for you. Learn what you need to know before your first sailing. Budget Travelers: These short cruise escapes offer great value for those who live near the embarkation port, with an affordable price tag that would be unbeatable back on land when you consider the cost of a hotel room, dining, and entertainment. 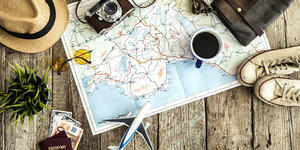 Plus, cruises to nowhere are priced at just a fraction of the cost of longer voyages that do incorporate ports of call. Get advice on budgeting your next cruise. The Time-Crunched: These mini-cruises fare well for those in need of a break, but who are simply short on time. If one's sailing from a close-to-home port and scheduled over a weekend, you won't even have to tap into those precious vacation days to set off on a little getaway. Locals: A cruise to nowhere couldn't be more convenient or affordable when it's leaving from your hometown. Skip out on the stress and expense of driving long distances or flying to your next vacation destination, and sign up for a hassle-free short cruise escape for some true R&R. 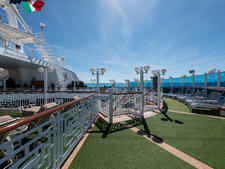 Cruise Buffs: Shiny new ships are sometimes revealed to the public for the first time via cruise-to-nowhere sailings. Cruise buffs, including many Cruise Critic members, are usually among the first in the know on the industry's next big thing, getting to sample the onboard amenities and innovative activities ahead of the pack. It's mostly midsize or big ships, with plenty of bells and whistles to keep passengers engaged for days spent at sea, that operate cruises to nowhere. However, the offerings are fairly rare. In the U.S., Carnival Cruise Lines and Norwegian Cruise Line are the only two companies to offer regularly scheduled cruises to nowhere. For the former, look for cruises out of Long Beach, California, as well as Norfolk, Virginia. 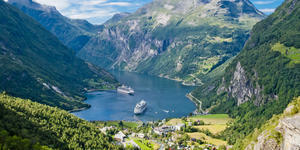 Norwegian offers two-night cruises to nowhere that it markets as "weekend escapes" out of both New York City and New Orleans. Royal Caribbean rarely lists cruises to nowhere in the U.S., but it does so on occasion to unveil brand-new ships or to introduce new deployments to a region. 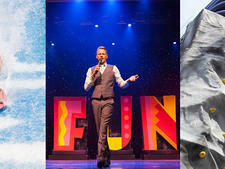 Disney Cruise Line doesn't regularly schedule cruises to nowhere but will feature a trio of the sailings out of San Diego in 2015. Cruises to nowhere typically leave from convenient big-city ports, though the exact embarkation points can vary from year to year, based on a cruise line's particular needs. In 2014-2015, sailings are currently scheduled from Long Beach, California (Carnival); Norfolk, Virginia (Carnival); New York City (Norwegian); New Orleans (Norwegian); Cape Liberty, NJ (Royal Caribbean); and San Diego (Disney). International ports also offer such sailings (for instance, Royal Caribbean runs several cruises to nowhere out of Sydney and Brisbane in Australia), as does P&O Australia, though it's highly unlikely that you'd opt to travel internationally to get onboard a ship with no ports of call. Read about Cruises to Nowhere for Australians. Unlike port-driven itineraries, which sail based on seasonality, cruises to nowhere don't adhere to any true fixed schedule and generally crop up as cruise lines' needs arise (for ship debuts, schedule gap fillers, etc.). It's preferable to embark on one when the weather is conducive to taking advantage of the on-deck pool areas and other outdoor activities, though that would likely involve leaving from a sunny year-round port, since we've rarely seen them posted for departures during the busy summer vacation months. Sleuth to Find a Sailing: These shorter cruises, usually just one or two nights in length, sometimes don't have compatible search parameters in place on cruise-booking websites, making them difficult to locate. You may need to hunt around a bit online -- Cruise Critic's Find a Cruise tool is a good place to start -- or turn to a cruise-specialized travel agent to find the most up-to-date cruise-to-nowhere options available. Study up Before Shipping out: You won't have the time advantage of a full week's sailing to casually uncover the layout and offerings of your ship. Don't waste time onboard a shorter cruise fumbling about to get your bearings. Cruise lines typically have ship maps and descriptions for onboard amenities clearly outlined on their websites, so you can arrive onboard with your compass intact and your game plan set. 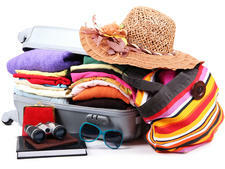 Don't Overpack -- or Unpack: It's hardly worth wasting time unpacking -- and packing up again so soon -- for such a quick trip, so don't overpack, and plan on keeping the contents of your luggage pretty much intact, short of putting out some toiletries and hanging up an item of clothing or two. (And forget about that formal dress. Cruises to nowhere don't have formal nights.) Plus, it's much more convenient if you can roll your own luggage both on and off the ship, rather than waiting around for porters to deliver it to and from your cabin. Show up on the Dot: Cruises typically have a window of a few hours where you can check in for your sailing, but when your cruising time is this limited, it's best to get there the earliest that they'll allow so you can maximize your time spent (and meals enjoyed) onboard. Beeline to the Spa: If you're planning on indulging in some spa time at sea, make sure to get to the spa reservations desk pronto, since the limited appointment slots will be snatched up fast. Some cruise lines will even allow you to book spa treatments in advance of your sailing, so do inquire ahead. Reserve at Restaurants and Shows: Seats at specialty restaurants are another limited onboard commodity, so if you have your heart set on dining at one, check in with the cruise line to see if you can reserve a table ahead of your trip. If not, make nabbing a reservation one of your first orders of business once onboard. Ditto for prime show times. On a Cruise to Nowhere, it's all about planning ahead. Editor's note: Due to U.S. government regulations, cruises to nowhere will not be allowed from American ports, starting in 2016. Ships leaving the U.S. will be required to call on at least one foreign port before returning to the U.S. Cruises to nowhere departing from foreign countries will not be impacted.